Every tablet and phone out there has its own dock, stand, and range of accessories. 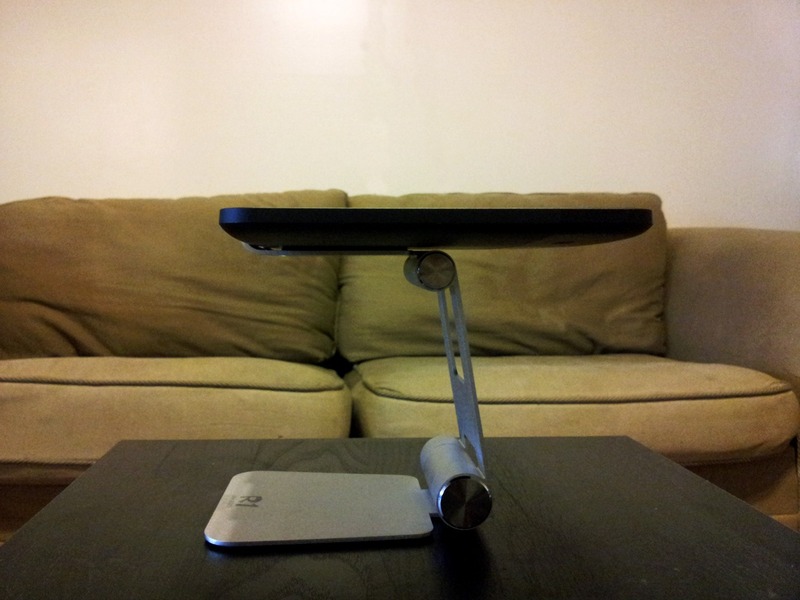 Few are quite as nice, however, as the R1 tablet stand from Satechi. At $50, this universal tablet stand is an investment. Unless you know you'll be using tablets for a while, you might want to skip this one. If you know you're in it for the long-haul, though, this stand will last. Satechi didn't skimp on the materials with the R1. 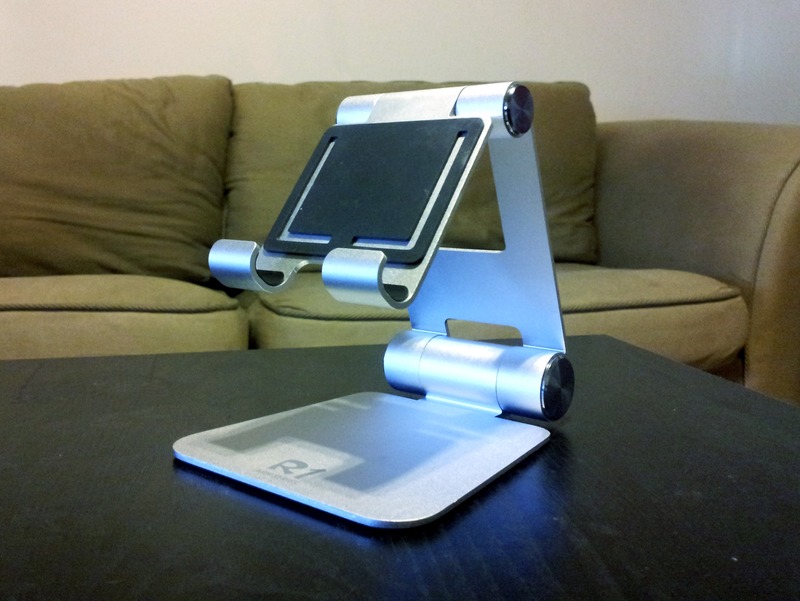 Unlike many first-party stands and docks that are made of plastic, this stand is made of a sturdy aluminum. Owners of Macbook Pros will feel right at home with this stand. There are also no-slip rubberized grips on the base of the stand, as well the arm to prevent either the tablet or the stand itself from sliding around. The hinges are sturdy and provide just the right amount of resistance. It's easy to adjust the angle of the arm without straining, but the weight of a tablet isn't enough to send the arm plummeting into your desk. The rubberized grips are enough to even keep the stand steady on a slanted surface, though we don't recommend it. The stand may be impressive, but tempting fate is always a gamble. The stand is very simple. A wide, flat base props up a two-hinged stand. The two hinges, however, provide quite a bit of flexibility. 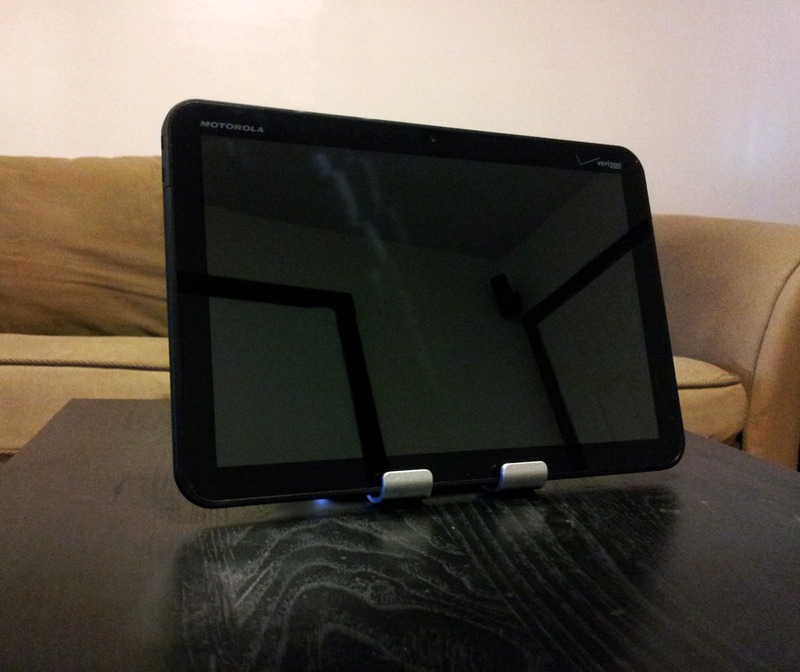 Your tablet can be positioned at just about any angle or height. This is perfect if you want to leave some room for a keyboard to fit directly underneath your tablet some of the time, and use it as a secondary monitor others. During my normal day, I keep my tablet open just next to the monitor on my Windows 7 machine while I write. The Motorola dock that I received after the LTE upgrade props the Xoom up pretty high, blocking part of my monitor screen. The R1, on the other hand, allows me to lower the tablet all the way to the surface of the desk and tilt the screen back so it points directly at my face without getting in the way. 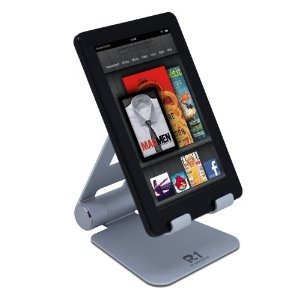 Whatever the position is that you need your tablet in, the R1 will hold it there. As always, it comes down to the money. The R1 isn't the most expensive stand in the world, but at $50, it's also not an impulse buy. Especially for a stand that doesn't charge your gadgets. There's gaps in the arm that provide space to plug in a charger, but that's one more accessory you'll need to buy. 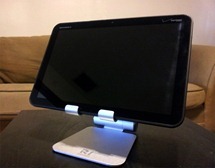 If you're considering this tablet stand, though, it's worth considering that it can accommodate just about any tablet. There's not much variance in tablet design, and we tested this device out with a Xoom and an ASUS Transformer. Both fit perfectly. If you buy any more tablets in the future, this may be the one accessory you don't need to upgrade. Not to mention it's built to last long enough to give you that chance.